For years, medical assistants and nurses have engaged in a friendly rivalry. Do licensed practical nurses (LPNs) really have a set of skills that are superior to the skill sets of medical assistants (MAs)? Is the work LPNs do intrinsically harder? Do they deserve more respect? In fact, there are more similarities than differences in the duties of an LPN and a MA. The reasons for selecting one career course over another have less to do with scope of practice than they have to do with other considerations like pay scale, possibility of advancement and where you are in your own life right now. Registered nurses (RNs): RNs are professional health care providers who have either earned an associate’s degree in nursing (ADN) or a bachelor’s of science in nursing (BSN). Before they can be licensed to practice, they must pass a national examination called the National Council Licensure Examination (NCLEX-RN). RNs are expected to comply with the legal stipulations for nursing practice in the state, in which they practice, as well as the policies and procedures in the facility at which they are employed. Licensed practical nurses (LPNs): LPNs are professional health care providers who are graduates of a one-year program offered by either a vocational/technical school or a community college. LPNs must pass a computer-based, national examination called the National Council Licensure Examination-Practical Nurse (NCLEX-PN). LPN scope of practice is defined by the nurse practice act in the state in which the LPN practices. Generally, this is done by specifying the scope of RN practice and then stipulating which of those tasks may be delegated to an LPN. Many LPNs believe they are more educated, better trained and therefore more competent than a MA. This is not actually the case. MAs and LPNs have very similar scopes of practice, and they go to school for a comparable length of time. A better way of looking at the difference between MAs and nurses is not that one is more or less competent, but that nurses have more potential specialties. Certified Nursing Assistants (CNAs): CNAs are health care workers who work in a variety of settings such as hospitals, skilled nursing facilities and assisted living centers. CNA responsibilities differ according to their employer and the state in which they practice, but CNAs always work under the supervision of RNs or LPNs. They are certified but unlicensed, meaning they are not subject to a mandatory credentialing process before they can perform their job duties. In order to become certified, CNAs must complete a course curriculum approved by the state in which they will practice. Courses are given by the Red Cross, community colleges and online education providers. Some institutions offer on-the-job training, but this is becoming more rare. A medical assistant, on the other hand, performs clerical, administrative, and clinical tasks that support the work of doctors and other health care professionals. Most MAs earn one-year certificates through a program offered by a vocational school, a community college or an online education provider. Some MAs have earned a two-year associate degree. MAs are not required to have certifications in order to work, and some employers will do on-the-job training. Common clinical tasks include taking vital signs, recording medical histories, explaining treatment procedures to patients and preparing them for physician examinations. In many states, MAs are allowed to perform more sophisticated procedures, such as carrying out basic diagnostic lab tests, drawing blood, giving injections, preparing and administering medications, removing sutures, changing wound dressings and even taking x-rays. MAs also perform many administrative duties. These can be divided into clerical tasks pertaining to office management and tasks specifically related to health care such. Health-related tasks include updating patient charts and electronic medical records, and processing insurance claims forms. LPNs and MAs are both required to complete a year of formal education at a community college or through an online education provider. Both have the option of extending this training by an additional year if they like. Tuition at a two-year community college varies from state to state, but typically costs between $2,300 per year for in-state residents to $10,500 for out-of-state residents. In comparison with LPNs and MAs, an RN has much more stringent educational requirements. These days RNs train for their careers by obtaining either a two-year associate degree or a four-year bachelor’s degree. There are still a small number of diploma programs where nursing education takes place primarily within a hospital setting, but these once-popular programs now turn out fewer than 10 percent of all RNs. Associate degrees are designed to prepare graduates for entry level RN jobs. The curriculum focuses on basic level nursing classes, covering medical surgical nursing, pediatric nursing, maternal and newborn nursing, mental health nursing and the fundamentals of patient care management. Students also take classes in nutrition, statistics, medical terminology, anatomy and physiology, and microbiology. Approximately 60 percent of all RNs graduate from associate degree programs. 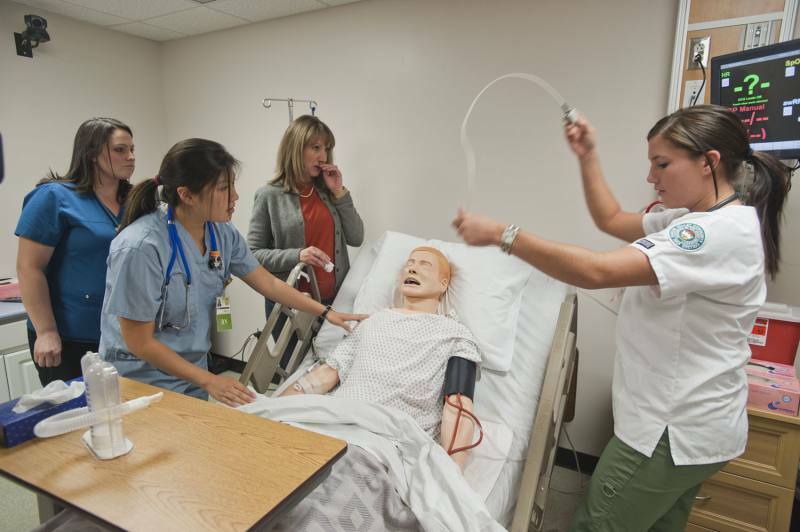 Baccalaureate nursing programs include all the classes give as part of the diploma and associate orientation, but offers additional training in principles of nursing management and leadership, nursing research and public health nursing. Approximately 37 percent of all RNs graduate from baccalaureate programs. The graduates of all three programs must pass the NCLEX-RN licensing examination before they can practice as RNs. Many associate degree graduates eventually go back to school to get their baccalaureate degrees. In fact, at just about every credentialing juncture, nurses can transfer credits, continue their education and move up a notch professionally. There are programs that prepare CNAs to become LPNs, there are LPN to RN bridge programs, and there are associate RN to baccalaureate RN shortcuts. There are numerous graduate nursing programs to help the baccalaureate RNs make the jump to nurse practitioner or clinical nurse specialist. In contrast, there are few if any avenues open for MAs who want to become CNAs or LPNs. MAs who want to move forward in their health care careers to become a LPN or a RN need to start from the beginning. One of the main benefits of medical assisting is that it doesn’t require licensure. Though the American Association of Medical Assistants (AAMA) offers certification, the process is entirely voluntary. Since a MA operates under a supervising physician’s professional license, MAs don’t generally need to carry their own liability insurance. They are covered under their employer’s policy. RNs and LPNs are both licensed, and both subject to disciplinary action should they violate the nursing practice standards of their state. RNs and LPNs are advised to carry their own liability insurance since they practice under their own licenses. Although a MA performs a comprehensive assortment of clerical, clinical and administrative tasks, nurses have a greater variety of clinical specialties open to them. Nurses achieve specialization through work experience or by pursuing professional certification in a given field. Medical-surgical nurses: Medical-surgical nurses provide care to adult patients who are hospitalized with any number of disorders, from acute injuries like broken bones, to sudden illnesses like infectious diseases, to chronic illnesses like diabetes and coronary artery disease. Pediatric nurses: Pediatric nurses provide care to infants, children and teenagers, whose physiology as well as anatomy is often quite different from adults. Nurse midwives: Certified nurse midwives receive advance training in obstetrics and gynecology. Neonatal nurses: Neonatal nurses work with newborn infants. They can specialize in working with healthy newborns or with premature infants in the Intensive Care Nursery (ICN). ICU nurses: Intensive Care Unit (ICU) nurses work with critically ill patients. ER nurses: Emergency room (ER) nurses care for patients who are seeking immediate attention for urgent needs. Since ER nurses typically see patients with a spectrum of health-related problems on any given day, they must have a broad base of knowledge and expertise in triage. Clinical nurse specialists: Clinical nurse specialists work with patients who have specific diseases or conditions. Oncology nurses, for example, work with cancer patients. Clinical nurse specialists generally have master’s degrees in their chosen fields. According to the Bureau of Labor Statistics, in 2010 the median annual wage for all RNs was $64,690. The median annual wage for LPNs was $40,380 while the median wage for CNAs was $24,010. MAs, at an median annual wage of $30,170, made 25 percent more than CNAs did. The pay scale for MAs and nurses varies by region, and also by whether or not nursing unions are strong in a given area. Nurses command the highest salaries in California where RNs can make up to $45 dollars an hour or $95,000 a year if they work full time. California is also one of the best states for MAs; the hourly mean wage in the Golden State is $15.29. In 2010, well over half of all MAs worked in physicians’ offices, according to the Bureau of Labor Statistics. Others worked in chiropractors’ offices, podiatrists’ offices, clinics, and urgent care centers. Increasingly, though, MAs are being hired by hospitals and assisted living facilities. Almost half of all RNs work in hospitals. The remainder work in physicians’ offices, nursing care facilities, government agencies and for schools. Almost 10 percent of all RNs travel to patients’ homes or community centers as home health care nurses or public health nurses. The majority of LPNs and CNAs work in nursing and residential care facilities. The remainder work for hospitals and home health care provides. Twelve percent of all LPNs work in physicians’ offices. To a large degree, the demands of the job are determined by the workplace. Since hospitals need to be staffed 24 hours a day, seven days a week, nurses who work in hospitals end up working irregular hours that include evenings, nights, weekends and holidays. Many RNs work on call. Approximately 20 percent of all RNs work 20 or fewer hours a week. The majority of MAs, on the other hand, work in settings like the offices of health care providers that keep regular 8 A.M. to 6 P.M. hours. MAs who work in urgent care clinics, however, may be called upon to work some evenings and Saturdays. Hospital nursing can be a physically demanding occupation. Nurses spend much of their time on their feet and are charged with unpleasant chores such as empting bedpans. RNs and LPNs who work with venipuncture and intravenous medications must also be on guard against accidental needle sticks. Long hours, irregular schedules and constantly changing workload as patients are admitted and discharged are all factors that contribute to stress. In contrast, MAs employed in practitioner clinics have a far less strenuous workload and experience less stress. Physicians and hospital human resources staff think the same way as any other prospective employer. They want employees who are competent, experienced and go that extra mile. When all other things are equal, prospective employers are likely to go with candidates who have professional certifications and licensures, since credentialing implies a higher level of uniform expertise. In the medical workplace, however, all other things are not equal. The rising costs of delivering health care are a huge concern to both patients and practitioners. As recently as 15 years ago, physicians’ offices were primarily staffed by nurses. Today, that is no longer true. Over half of the nation’s 527,600 MAs work in practitioners’ offices. MAs can be paid less than RNs and LPNs, so this represents a huge cost savings to these health care providers. The Bureau of Labor Statistics cites the health care industry as one of the few recession-proof industries because demand for health care is not based on discretionary spending. The Bureau of Labor Statistics projects that the MA employment will increase by 31 percent between 2010 and 2020. The demand for MAs will continue to grow as the demand for physician-provided preventive services continues to grow. As we have seen, physicians prefer to staff their offices with MAs rather than more expensive nurses. MAs can only operate under the direct supervision of a physician, however, which means they may not be effective employees for a fast paced health care delivery environment like a hospital where employees need to be able to make decisions on their own. LPN and RN employment are also expected to increase by 22 percent and 26 percent respectively, as the baby boom demographic ages, home health services become more popular and an increasing number of procedures that were once performed only in hospitals are outsourced to clinics and outpatient care centers. What advantages do medical assistants have over nurses for prospective employers? MAs are a cost-effective way to address growing workloads. As we have seen, the median annual wage for MAs is $29,100, while the median annual wages for RNs and LPNs are $64,690 and $40,380 respectively. MAs are generalists. They function both as office administrators and medical staff. They can work in every aspect of a medical practice from answering phones, scheduling appointments and entering data in electronic medical records to taking medical histories, drawing blood and administering electrocardiograms (EKGs). Because they can function both in an administrative and medical capacity, MAs are adept at managing patient flow so that patients feel that their needs are being met. Satisfied patients are the basis for every successful physician practice. What advantages do nurses have over MAs for prospective employers? Nurses specialize in patient care. RNs follow physicians’ orders, but they are also trained to recommend care and treatments on their own for injuries and medical conditions. RNs are capable of providing a system of checks and balances for physicians. Within the sphere of patient care, nurses have many more specializations open to them than MAs do. RNs are trained to perform more invasive patient procedures, such as starting IVs and administering IV medications. In most states, LPNs can also perform these procedures. In contrast, MAs only perform invasive patient procedures if the state they’re working in allows it and their employer needs them to do it. Medical Assistant Job Description: What do MAs do? Medical Assistant Salary: How Much Do Medical Assistants Make? Gender Discrimination – Is It The Case In Medical Assisting?